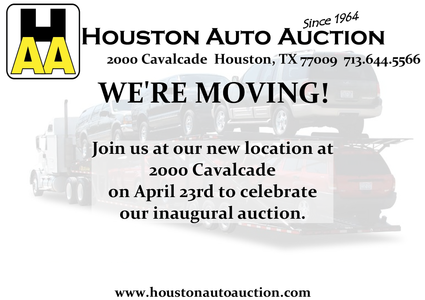 2000 Cavalcade, Houston, TX 77009 starting April 22nd with first auction on April 23rd! For More GSA Information, see below! Additional information is available on GSA's web site at: autoauctions.gsa.gov. GSA sale information for Public individuals and businesses can be found at: www.haapublicsales.com. Download and read GSA's Sale Terms & Conditions. All winning bidders should check their vehicle manufacturers web site for possible recalls. Effective June 30, 2012, GSA restricts individual credit and debit card purchases to $24,999.99 per sale. Any credit or debit card transactions that exceeds this limit will be rejected. Download GSA's Registration Form GSA Form. This form must be done EACH MONTH. ATTENTION ONLINE BUYERS. YOU MUST CHECK WITH US BEFORE SENDING PAYMENT. YOUR TOTAL FEE MAY BE MISSING BUYER AND PSI FEES. If you would like to receive updates and information about upcoming events and auctions, sign up here. We promise to never sell or share your information, and you can un-subscribe at any time. Donate your vehicle to the charity of your choice and make a difference to those in need. Visit our charities for more details.